During the summer of 2004, more than two dozen monitoring wells were installed in the Newhall neighborhood. 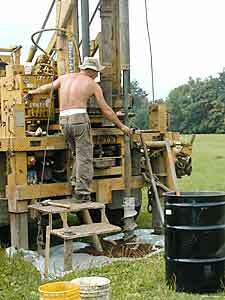 They are used to collect ground water samples every three months. 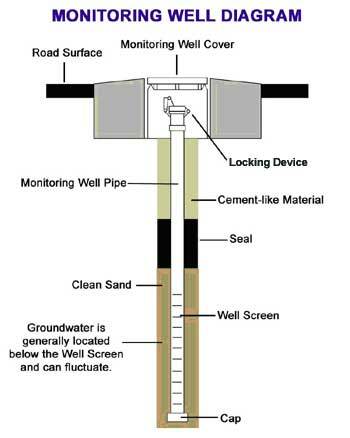 The wells (see diagram below) are narrow tubes with slots that allow groundwater to seep through at a depth ranging from 15 to 40 feet. In July 2014 the Department of Energy and Environmental Protection discontinued ground-water monitoring of residential properties because sampling results indicate the groundwater meets groundwater protection criteria and further testing was no longer needed. The wells are dug by using a hollow stem auger rig. 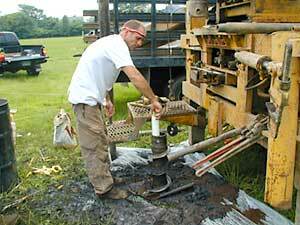 The rig hammers a hollow cylinder into the ground and pulls out the soil within the cylinder. Excavated soil is shoveled into drums and removed from the site to prevent exposure to contamination. The rig operator keeps track of the depth of the auger so he knows how deep the well will be placed. At this well site at the Middle School the top layers of soil appear dark brown and sandy. Deeper down the soil becomes black matrix fill. This fill can have elevated levels of lead, arsenic, PAHs and petroleum by products that may have been used in the gun manufacturing process. Both the soil and black fill are seen at the base of the auger drill in the photo at left. 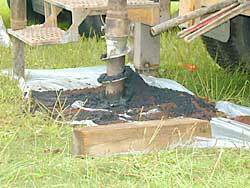 As the well is dug, soil is removed from the hole for testing and described by its color, texture and characteristics. 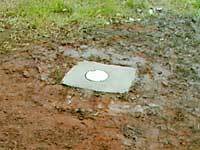 The hole for the well is dug until the native soil layer is reached. The technicians knew they had reached native soil when the soil color turned from black to a dark brown color and had a peat-like texture – the kind of soil that would be found in a wetland area as the Hamden Middle School site once was. To complete the well installation, technicians dropped a PVC pipe into the hole they had dug. The pipe at the bottom of the well had slits and was surrounded by sand so water could seep through it and later be collected and tested. The rest of the PVC pipe was solid and surrounded by a cement mixture to prevent water in the upper levels of the soil from getting into the monitoring well. Testing the exact area of contamination is done by limiting where water can get into the pipe. Once the well is lowered into the ground it is capped and set into concrete. Every three months technicians remove the cap and take water samples for laboratory testing.